The hot weather will continue, but there’s some cool relief in sight. For the first time in days Connecticut does not have a heat advisory on Wednesday. Temperatures should peak into the mid-80s. Some school districts will again have early dismissals Wednesday. Schools include: North Haven (elementary only), Stratford and Trumbull. In Waterbury, public schools, Kaynor Tech. Holy Cross and Sacred Heart high schools. 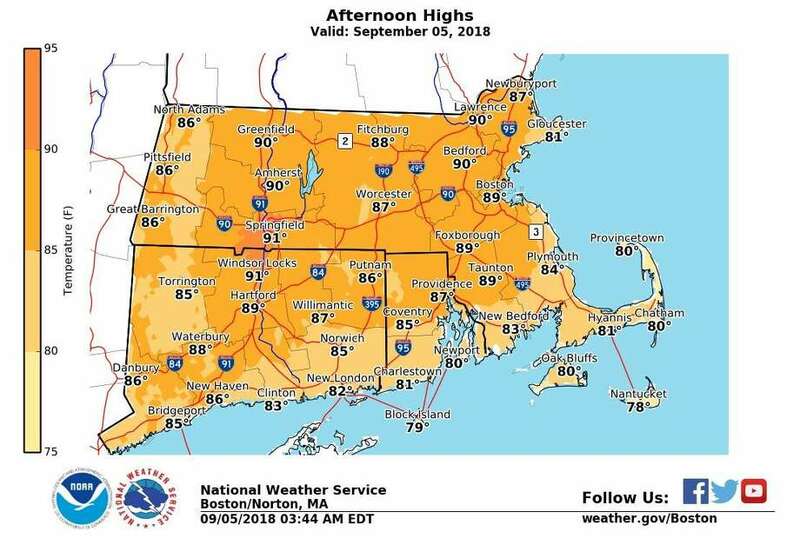 In Easton, Helen Keller Middle School will be closing at 12:50 p.m.
On Tuesday, Tweed-New Haven Airport hit 90 degrees for a new high temperature record for the day. It was New Haven’s seventh 90-or above day of the summer. Sikorsky Memorial Airport in Stratford and White Plains airport, near Greenwich, also set a new record of 89 degrees. Danbury’s high was one degree cooler. Thursday will be our last hot day of the week with temperatures a few degrees warmer than Wednesday. Heat indexes are expected in the mid-90s. As a cold front moves in Thursday afternoon and evening, the NWS says isolated, strong and severe thunderstorms are possible. “Gusty winds would be the primary hazard,” it says in its forecast discussion. Those hoping this will be the last of 90-degree days may be disappointed. Last year, Danbury had one 90-degree day on Sept. 24, followed by three days of temperatures that hit 89 and 87 degrees. The weekend is looking much cooler with highs in the low 70s. Saturday will be the better weather day of the weekend with partly sunny skies; Sunday will be mostly cloudy with a chance of rain. Today: Mostly sunny, with a high near 85. Light and variable wind becoming south 5 to 7 mph in the morning. Tonight: Patchy fog after 2 a.m. Otherwise, partly cloudy, with a low around 74. South wind 5 to 8 mph. Thursday: A 40 percent chance of showers and thunderstorms after noon. Patchy fog before 8 a.m. Otherwise, mostly sunny, with a high near 90. Heat index values as high as 97. Southwest wind 6 to 8 mph. Thursday Night: A chance of showers and thunderstorms. Mostly cloudy, with a low around 69. Calm wind becoming northeast 5 to 8 mph after midnight. Chance of precipitation is 50 percent. Friday: A 20 percent chance of rain before 9 a.m. Mostly cloudy, with a high near 78. Northeast wind 7 to 9 mph. Friday Night: Mostly cloudy, with a low around 63. Saturday Night: Mostly cloudy, with a low around 58. Sunday: Mostly cloudy, with a high near 70.